Nusa Penida’s Crystal Bay provides an animated visual feast of colourful marine life, but beware the currents that create the show. As you might expect the waters of Crystal Bay in Nusa Penida are crystal clear and I don’t mean like glass, I mean like crystal, every colourful fish positively sparkling in Technicolor! There are plenty of colourful reef fish of all shapes and sizes, colours and hues, all very lively amongst the colourful soft corals, Xenia and sea anemones. The constantly animated scene is a visual feast. 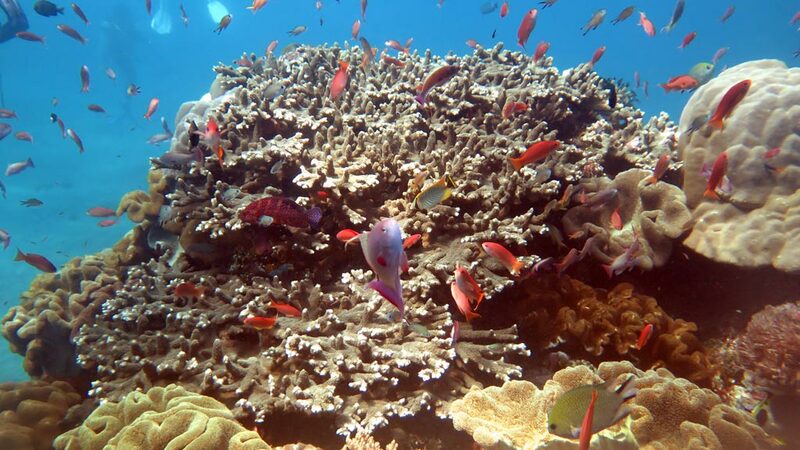 The first fish to catch the eye are the anthias – the purple males herding their harems of orange females. There are butterflyfish in every shade of yellow and every design: spots, stripes and lattices. It’s these butterflyfish that usually groom the Mola Mola (the sunfish) that are spotted here seasonally. Add in angels, surgeons, coral trout and puffers and porcupines, plus a variety of anemonefish in their various types of anemone, and you’ll start to get the picture. The reason for all this life is the constant current which brings cool, fresh, clear water and also nutrients from deeper areas beyond the Bay. And the reason for this current is the Indo Pacific Throughflow – water flowing from the Pacific into the Indian Ocean delivering 15,000,000 m³ per second, at an average speed of 1 km/h. Of course when this water passes between the islands of the Indonesian chain it speeds up even more. So as well as delivering nutrient-laden clear and cool water, so beloved by Mantas and marine life generally it can also deliver strong currents, both horizontally and vertically (up and down) as it smacks into a vertical wall or prominent corner. This is why the dive sites like Manta Point and Crystal Bay at Nusa Penida consistently deliver great diving on what they’d been named for. Just beware the potential for unexpected currents while you enjoy them. There’s a very relevant article on downcurrents here by DAN AP’s Director. And if you don’t feel up to it, go to Nusa Lembongan instead – almost as pretty but with a very gentle current.